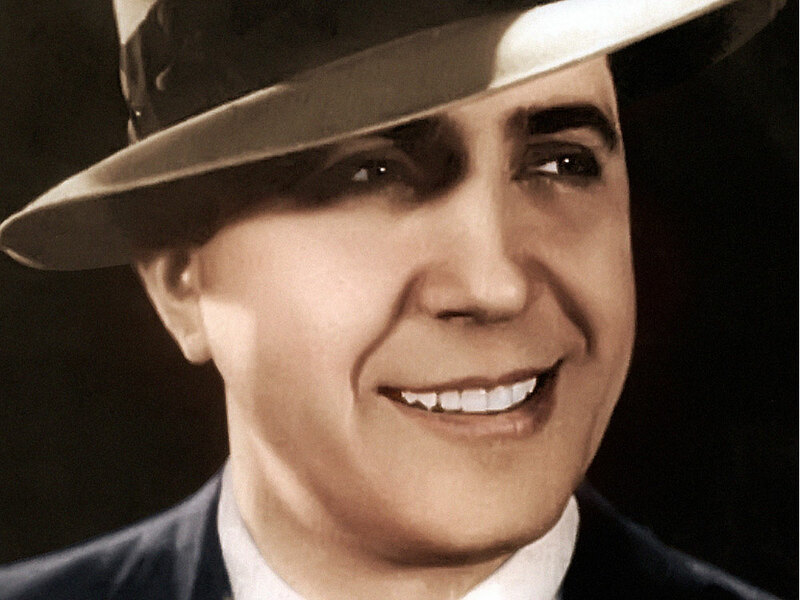 Carlos Gardel: Argentina's Tango Maestro The suave singer is synonymous with tango. Gardel revolutionized the style of music and brought it from the underground dance salons to the mainstream. Though he died more than 75 years ago, his recordings continue to leave a lasting impact on tango musicians and enthusiasts around the world. On the streets of Buenos Aires, Carlos Gardel's image is everywhere: the suave singer who introduced tango, a symbol of Argentina's "Golden Age," to the world. His life and death are the stuff of legend. "Gardel is the greatest, the greatest, the greatest," says taxi driver Miguel Angel Godinho, who drives through Buenos Aires blasting old recordings of the tango maestro. "Look, I have goosebumps talking about him. I never get tired of listening to him." Like many Portenos, as the people of Buenos Aires are known, Godinho continues to be extremely passionate about his idol, who died more than 75 years ago. Gardel grew up singing in local bars, restaurants and markets in Abasto, once a neighborhood of Italian immigrants. The house where Gardel lived with his mother is now a museum filled with photos and artifacts: Gardel's sheet music and instruments, an old Victrola, newspaper clippings of his international travels and movie posters featuring the debonair crooner. Horacio Torres, director of the Carlos Gardel Museum, says Gardel was a thoroughly modern figure who revolutionized tango and created a sensation in the 1920s and '30s. "Gardel is a symbol of the immigrant who triumphs," he says. "He was a boy from the middle class, a neighborhood singer who captivated the world." International scholars continue to argue over Gardel's origins; Uruguay also claims him as its own. But biographer Oswaldo Barsky says documents prove Gardel was born in Charles Romuald Gardes in Toulouse, France, to a single mother. They moved to Argentina's capital when he was a baby. Gardel grew up working at opera houses -- Buenos Aires had five at the time -- as a professional applauder who roused the audiences. He learned to sing operas and Spanish operettas, or zarzuelas, in addition to criolla music, a folkloric style from the Argentine countryside. Then Gardel took it one step further and began singing tangos, like his first recorded hit from 1917, "Mi Noche Triste." "Mi Noche Triste," or "My Sad Night," is a now-classic tango story of a man pining for the woman who rejected him. The song was nostalgic and melodramatic, capturing the sentimentalism of Buenos Aires itself. Before Gardel's interpretation, almost all tangos had been purely instrumental. "One of the greatest revolutions of tango is that recording of 'Mi Noche Triste,' " Gardel aficionado Juan Carlos Apicella says. "That's when singing tango was born. After that, everyone began writing poetry for tangos." In Argentina, the tango had begun as music and dance for men looking for work during the Great Depression. But Gardel helped popularize the style as it moved from the underground dance salons to the upper classes. Images of Carlos Gardel, like this one on a storefront in Buenos Aires, are still scattered throughout Argentina. "He was the creator," says Oscar Del Priore, founder of the National Tango Academy. "Everything that came after Gardel is Gardeliano." Like many fans, he uses Gardel as a noun, an adjective and a verb. In the 1930s, Gardel introduced tango to the rest of the world. With his ensemble of Argentina's best guitarists, he went on tour to South America, France and the U.S. His celebrity was catapulted even further when he began starring in Spanish-language movies. Gardel formed his own production company and distributed 10 films through Paramount Pictures. His first talkie movie role was in the 1931 film Las Luces de Buenos Aires ("The Lights of Buenos Aires"). Gardel portrayed a gaucho, or Argentine cowboy. Onscreen, he embodied the archetypal Latin lover with panache: an elegant gentleman with a fedora, suit and tie. "How cool he was," recalls Argentine composer and producer Gustavo Santaolalla. "What a sense of style, as an artist and a gentleman. He always had that classy feel to whatever he did." Santaolalla says Gardel's romantic music and graceful style are part of the genetic makeup of every tango musician that followed him. "He's such an iconic figure and part of who we are as Argentineans," Santaolalla says. "He was one of the greatest voices, and he has written incredible music with great lyricism. 'El Dia Que Me Quieras' is one of the most beautiful melodies ever written." Santaolalla calls Gardel's composition a masterpiece.
" 'El Dia Que Me Quieras,' 'The Day You Love Me' -- that day, all these incredible, magical things are going to happen," he says. Biographers say Gardel experimented with the electric microphone when it was first introduced, and was the first Argentine musician to star in the short musical clips played before movies. "Gardel was a worldwide phenomenon," says Barsky, who notes that the singer inspired masses of groupies long before The Beatles. The singer also spurred many legends, including the story of how he was once shot in the chest during a street brawl. "The doctors decided it was too dangerous to operate, so the bullet stayed in his lung the rest of his life," street musician Juan Carlos Ivanhoff says. "On his recordings, you can hear him breathing with that bullet still in his lungs. It never bothered him." Biographers say the story is true, though they dispute another part of the legend: that the gunman was related to another famous Argentine, the revolutionary Che Guevara. In 1935, when he was just 45, Carlos Gardel was killed along with his entourage and longtime collaborator, Alfredo Le Pera, while touring South America. Their private plane crashed in Colombia, where he is still considered a hero. "Gardel's death was a classic tragedy," says Del Priore, who notes that Gardel was a movie star struck down at the height of his career. "It was a fantastical death, like his life had been." Newsreel accounts follow the huge outpouring of affection after his death: Gardel's casket was paraded through the streets of Medellin before hordes of mourners. His remains were carried across the mountains of Colombia, and by steamboat to New York, Rio de Janeiro, Uruguay and, finally, Buenos Aires -- each stop inspiring massive street memorials. Seventy-five years later, Gardel's fame lives on, in Buenos Aires and beyond. Tango cable networks continue to showcase his films. And every Sunday morning, local radio station Sensaciones broadcasts an hourlong show devoted to him. "Gardel is our patrimony," says radio host Juan Carlos Apicella, who belongs to an association devoted to sharing Gardel's music. "There is only one Gardel." There's a popular Latin American saying: "Cada dia canta mejor." It means every day, Gardel sings better; his music ages like a fine wine. 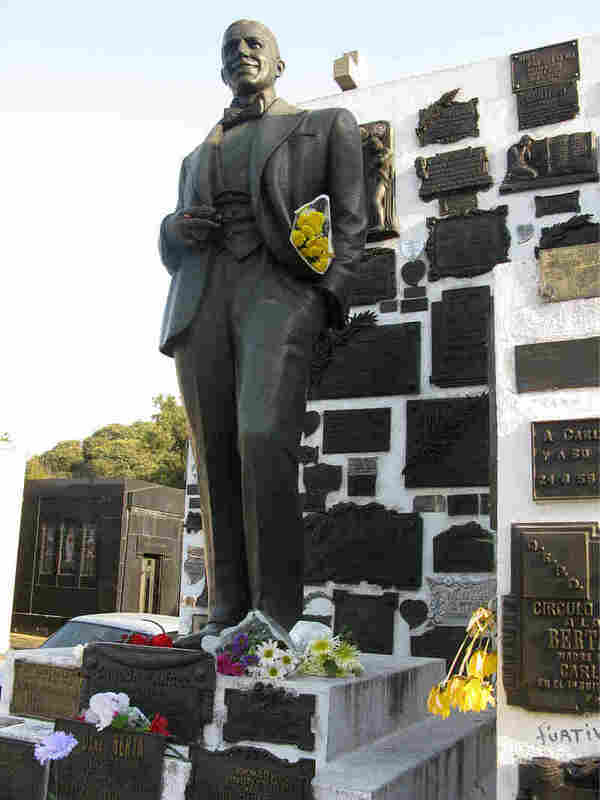 Carlos Gardel was buried at Chacarita Cemetery in Buenos Aires. His fans still visit to pay their respects, often lighting a cigarette that they put it in the hands of his elegant bronze statue and placing a rose in his lapel.